This topic contains 1 reply, has 2 voices, and was last updated by Andy 1 year ago. I would like to change the default Slider Background depending on the language settings (using Polylang plugin). I can’t find the exoplanet_slider function, where it seems that the default slider background is displayed, right ? We have added this to the very latest version of Exoplanet (version 1.7.1) as it was previously missing from the ‘String translations’. 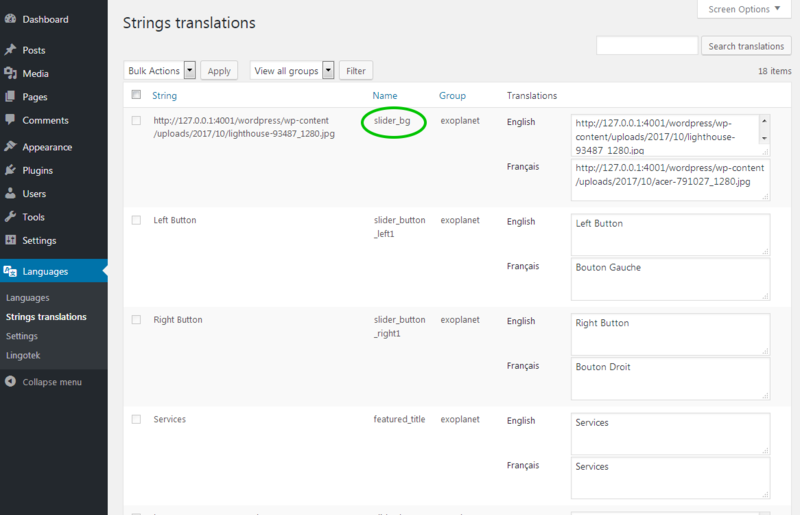 Please update to version 1.7.1 and then in the Polylang settings, ‘Languages’ > ‘String translations’ you will now see the ‘slider_bg’ string where you can add different image URLs for your extra languages. The topic ‘Multiple Default Slider Background Image’ is closed to new replies.